Many parents know the frustration and misery of having an infant with colic. Try as they might, there often seems to be no way for concerned parents to calm a crying child. Though researchers haven’t been able to pinpoint the cause of colic — a commonly held belief is that it stems from a digestive issue — a research team has suggested that colic is rooted in the baby’s developing respiratory control system. The team also proposed that what causes an infant’s vulnerability to colic may be the same as what makes an infant at risk for sudden infant death syndrome (SIDS). In a paper published recently in the journal Family Relations, lead researcher James McKenna, director of the Mother-Baby Behavioral Sleep Lab and Rev. Edmund P. Joyce, C.S.C., Professor of Anthropology at the University of Notre Dame, and his colleagues suggest that the origin of both colic and SIDS may be related to the gradual emergence of an infant’s ability to voluntarily control the release of air through the vocal tract, learned skills that are required for the development of speech. 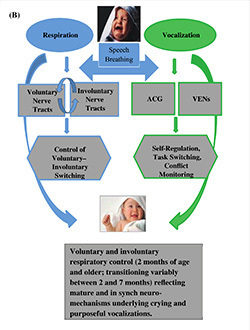 McKenna points out that infants are susceptible both to colic and SIDS during the same narrow developmental window, between about six to 14 weeks — the time period during which the respiratory system is learning how to shift between voluntary and involuntary control of breathing that involves both the “thinking” part of the brain (the cortex) and the brain stem. For the first month or so of life, McKenna explains, the breathing process is controlled exclusively by the brain stem, with the infant having no control over vocalizing. But through about seven months of age, the brain stem becomes increasingly more functionally integrated with the cortex, essentially sharing the control of breathing between two sub-systems. During this less stable period of breathing control, infants are most susceptible either to colic or SIDS. McKenna and his colleagues suggest one kind of “glitch” involved in SIDS may be the result of these integrating neural tracks developing at different rates, leading to a sleeping infant experiencing sleep apnea, or an involuntary pause in breathing, that is not stopped by either sub-system. The researchers suggest the signals moving from one control system to another just aren’t strong enough, preventing the infant from being able to purposefully arouse itself to take a breath. 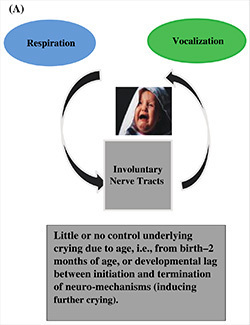 An infant experiencing colic may be unable to stop crying due to the brain’s sub-systems failing to stop the agitated breathing cycle, scaring the child into continuing to cry. “What if, as regards the seemingly inconsolable crying of colic, the infant is as much a victim as its parents?” McKenna asks. “What if the infant has no control whatsoever over stopping its crying nor the involuntary breathing that sustains it, with voice and breath becoming temporarily locked together, not permitting the infant to disassociate one from the another? The research team emphasizes that the model presented in their paper has yet to be tested, but observes that several lead SIDS researchers have taken note. The first step in testing the model is by using magnetic resonance imaging to look at the neural structures involved when sleeping infants experience an apnea followed by a cortex-induced arousal. 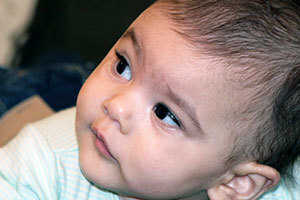 This same technique can be used safely on infants during inconsolable crying, to see if the activity occurs where the model predicts. Wendy Middlemiss of the University of North Texas and Mary S. Tarsha of Vanderbilt University are co-authors of the study. The paper can be found here: http://onlinelibrary.wiley.com/doi/10.1111/fare.12178/abstract. Originally published by Brittany Collins Kaufman at news.nd.edu on November 17, 2016.